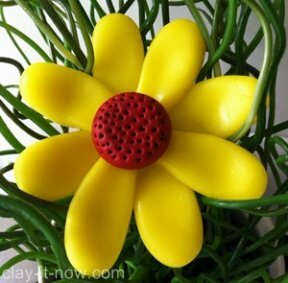 Simple daisy clay was created with only two clay basic shapes, ball and teardrop shape. If your daughter loves playing with custom jewelry, why not learn to create her own jewelry piece? 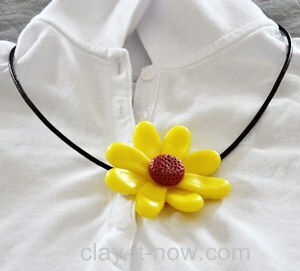 Create beautiful daisy clay pendant or brooch or fridge magnet with my step-by-step tutorial now. Air dry clay. 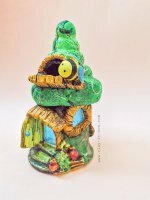 You can use children soft clay from your local store or make your own clay with my modeling clay recipes. I used cold porcelain clay for this flower. Ready-made necklace or pin for brooch or magnet. First of all, choose the color you like for the daisy. I use deep yellow clay for the petals and red with a little bit of black for the center part. Divide the yellow clay to 8 equal parts or 4 pieces bigger than the other 4. Place the yellow clay in between your palm, roll it to a ball shape and than to the teardrop shape. Do it for all petals. Roll the red clay to a ball shape for the center of the flower. Flatten the teardrops shape with your finger to form nice petals. Arrange the petals on your table. Place the first four petals crossing and overlapping each other, forming a shape like plus sign. Secure the petals with glue. Take the red ball clay shape, flatten it and pierce the clay with your clay tools or toothpick. Place the red clay in the center of the flower and let it dry completely. Drying time depends on the thickness and size of your flower. My daisy clay with diameter of 6 cm dried completely after 2 days. Alright! You have the flower now. What would like to do with it? Do you want to use it for children jewelry? picture frame decoration? make several of flowers, arrange it on the frame and use it as wall art. Did you make this simple flower? Would you like to share your picture with us? Please use the submission form or post your picture to our Facebook page.